Fill out our simple form and get quotes from local corporate lunch caterers. Business lunch catering needs to be delivered seamlessly, when time is tight for hungry colleagues and clients with busy schedules. Important meetings, team building or training sessions can all involve long days where refreshment and refueling at lunch becomes very important! Find corporate lunch catering here. We know that timings are of the essence with a business lunch and so is quality and presentation! We will ensure that your business lunch is well catered for and we can cater for any size! Our Corporate BBQ and Hog Roasts are second to none, with various marinated meats to choose from, we are sure to make your taste buds wake up. We also provide Halal options. Providing the perfect brain food for a working lunch, our business menus feature a tasty range of homemade sandwiches, savoury sides and cakes. Pizzas for lunch anyone? We can cater for your event with delicious pizzas. Whether you want canapes or something more substantial, we can cater for your business lunch. Contact us for your bespoke quotation. Bacon butties! Antipasti sharing boards, finger foods ... these are just a few options that we can provide for on the go business lunches. Typically consisting of cold meats, quiches and salads. This typically consists of sandwiches, savouries and crisps. Typically you would choose from options, for example, lasagne or curry with an accompaniment such as rice or bread. A mixture of hot, cold and finger buffet options. Please be aware that selecting this option may lead to less quotes being received. Some buffet caterers may have a lower price for any children's meals. If there will be no children, please leave blank. Most of us have been there at some point, if not regularly, where a meeting, important presentation or training session becomes a long and tiring day. Lunch is the saviour that breaks up work, allows everyone to refuel and take a rest. Business lunch catering needs to be organised and efficient, often keeping to a tight schedule. Perhaps impressing clients is important, or perhaps nutritious and healthy food is on the agenda. 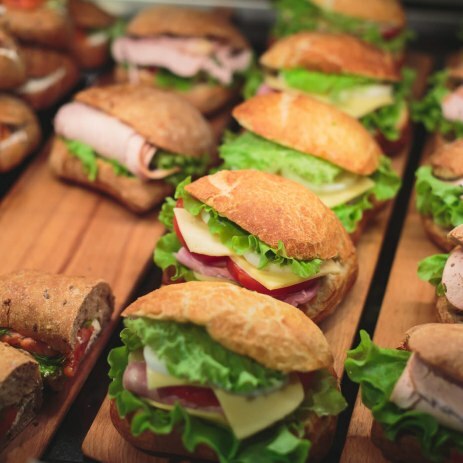 Our business lunch caterers are experts and are experienced in dealing with a range of requirements and specifications for an array or businesses. We also realise business lunches can be an essential time for networking and building relationships, so whether you prefer a sit down meal or a casual buffet, let our corporate lunch catering teams design your ideal business lunch. Make an enquiry and request quotes online here.